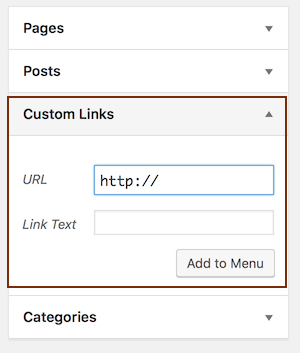 You can add a menu item whose link goes to a specific section on the same page or a section on a different page. This works with any WordPress menu, which you can create and edit either on the Beaver Builder Theme's Menus tab in Customizer, or by clicking Appearance > Menus in the WordPress admin panel. It also works in the Beaver Builder plugin's Menu module, in which you select one of the WordPress menus you've created. Note: If the section is on the same page, there's a smooth scroll to the linked section. If the link goes to a section on a different page, there's an immediate jump to that section on the other page. This technique involves two steps: adding a unique ID to the target section in a Beaver Builder layout, then adding the link with that unique ID to your WordPress menu. Tip: You can add the ID to a module, a column, or a row, but the target tends to position best if you add the ID to the row containing the item you want to link to. Also, if the section is near the end of the page, the scrolling section may not go directly to the section with the ID. This is a property of how browsers handle links to targets. In the Beaver Builder editor, open the row (or column or module) that you plan to link to. Click the Advanced tab and scroll down to the HTML elements section. For the ID setting, add a unique value such as my-unique-id. ID values may only contain alphanumeric characters, hyphens, or underscores. Tip: It's a best practice to prefix the ID value with something that helps identify it as coming from you. For example, if your business name is Best Website Designs, your ID value might be bwd-menutarget-1. Just make sure the ID value is something different from any other ID on your site. On the WordPress admin menu, click Appearance > Menus and make sure the menu you want to use is displayed. In the left column expand the Custom links category. Enter whatever link text you want your menu item to display. Where can I display menus?